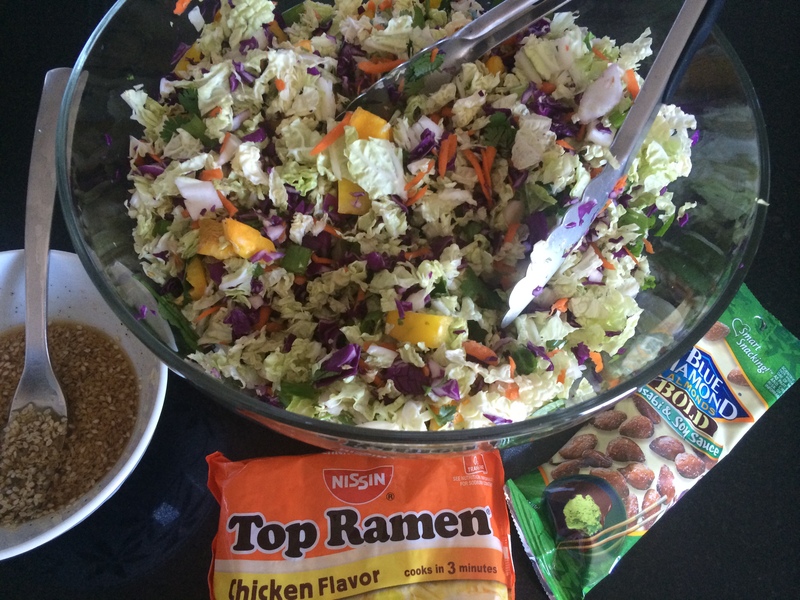 I make my famous Chinese Ginger-Sesame Salad two or three times a week. I chop up a yellow bell pepper, two green onions, cilantro, a carrot, a head of napa cabbage, some purple cabbage, a tangerine, a bag of crushed Top Ramen, and a bag of crushed roasted almonds, all by hand. It takes a while, but it’s worth it. I make the dressing with minced ginger and garlic, lemon juice, rice vinegar, toasted sesame seeds, salt, pepper, 10g of sugar, and 15g of toasted sesame oil. All together, there’s about 1000 calories in the salad, including 25g of protein, and 45g of fat. I eat it all in one sitting. If I’m still hungry afterwards, it’s real hunger, since the bulk of the salad and fibre do it’s best to fill up the stomach.